Wesson® Pure & 100% Natural Best Blend. 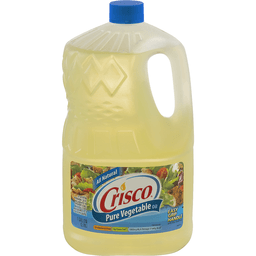 A blend of pure vegetable oil & canola oil. Taste the food. No the oil. 0g trans fat per serving. Cholesterol free. See nutrition information fat & sat fat content. 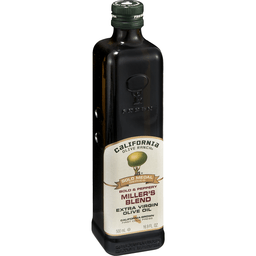 Best blend oil is a cholesterol-free food with 14g total fat per serving. Per 1 tbsp serving: 130 calories. 1.5g sat fat, 8% DV. 0mg sodium, 0% DV. 0g sugars. Pure Wesson: The Heart and Soul of Good Food®. 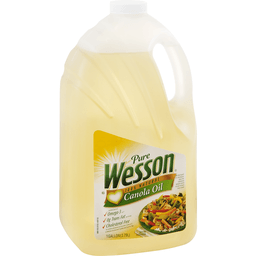 First created by Dr. David Wesson in 1899, all Wesson oils are highly purified and contain zero grams of trans fatty acids per serving. 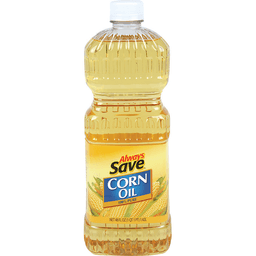 A great oil for frying with the added benefits of Canola oil. Pure Wesson 100% natural best blend oil is highly versatile. 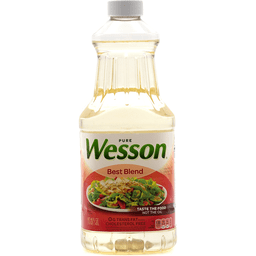 Wesson best blend oil is a perfect combination of two great oils that makes it just right for everything from grilling and frying to salad dressings. Usage tips: Grilling, broiling & frying marinades & dressings - allows spices and herbs to shine through. Baking - substitute for melted butter, margarine or shortening. ConAgra Foods®. Food you love. Questions or comments: Visit us at www.wessonoil.com or call Mon.-Fri., 9:00 AM-7:00 PM (CST), 1-800-582-7809 (except national holidays). Please have entire package available when you call so we may gather information off the label. For fat free cooking. Calorie free. Sodium free. Cholesterol free. 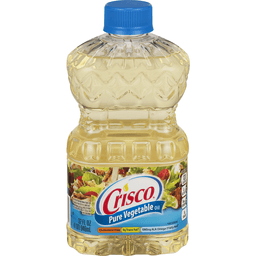 Crisco® Pure Vegetable Oil. Cholesterol free. 0g trans fat*. 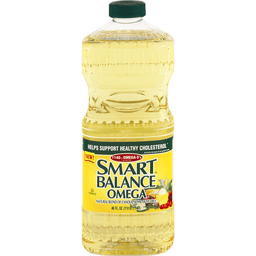 1060mg ALA omega-3 fatty acid*. *Per serving. Per 1 Tbsp. 120 calories. 2g sat fat 10% DV. 0mg sodium 0% DV. 0g sugars. See nutrition information for fat and saturated fat content. 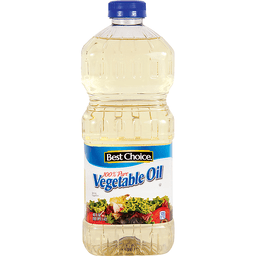 Vegetable oil is a cholesterol free food with 14g or total fat per serving. 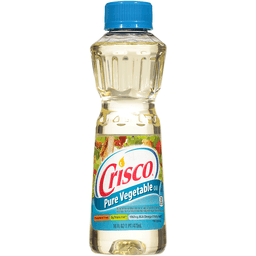 Crisco is Cooking™. 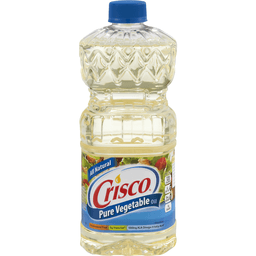 Crisco® pure vegetable oil is versatile for all purpose cooking. 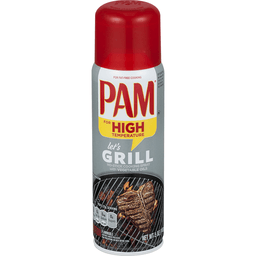 Great for: Sauteing. Pan-frying. Baking. Questions Comments 1-800-766-7309. ©/TM/® The J.M. Smucker Company. 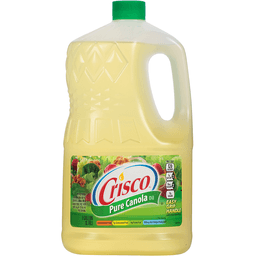 www.crisco.com. 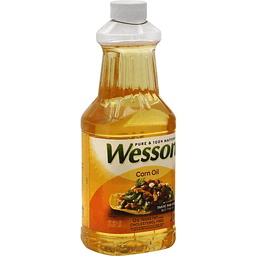 Wesson® Pure & 100% Natural Corn Oil. Taste the food. Not the oil. 0g trans fat per serving. Cholesterol free. See nutrition information for fat & sat fat content. 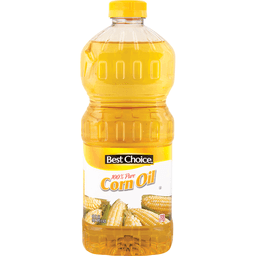 Corn oil is a cholesterol-free food with 14g total fat per serving. Per 1 tbsp serving: 130 calories. 2g sat fat, 10% DV. 0mg sodium, 0% DV. 0g sugars. Pure Wesson: The Heart and Soul of Good Food®. 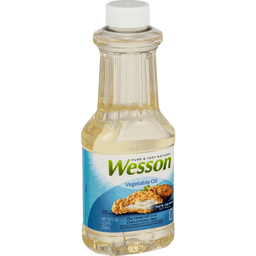 First created by Dr. David Wesson in 1899, all Wesson oils are highly purified and contain zero grams of trans fatty acids per serving. 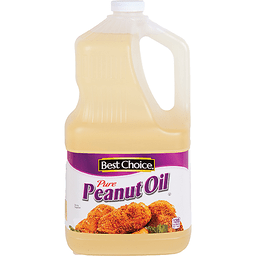 The ideal oil for crisp, tender fried foods. 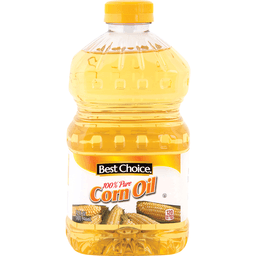 Pure Wesson 100% natural corn oil is the best oil to ensure a crispy coating on your fried foods while retaining moistness on the inside. 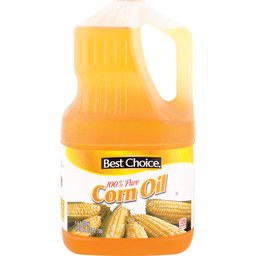 Wesson corn oil brings out a natural rich flavor in fried foods and in flavorful ethnic dishes. Usage tips: Deep frying - fried chicken, French fries, fried fish, fried appetizers. Ethnic foods - Mexican and Southwestern foods. Baking - substitute for melted butter, margarine or shortening. ConAgra Foods®. Food you love. Questions or comments: Visit us at www.wessonoil.com or call Mon.-Fri., 9:00 AM-7:00 PM (CST), 1-800-582-7809 (except national holidays). Please have entire package available when you call so we may gather information off the label. Pure vegetable. Naturally clear. Fat free. Cholesterol free. Calorie free. Sodium free. Stops food from sticking to all cookware. Makes clean-up easier. Pans and utensils wipe clean without soaking, scraping or scouring. 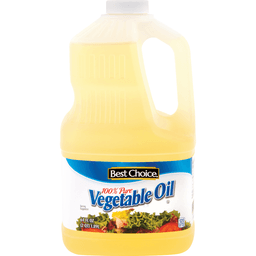 Contains canola oil, one of the healthiest vegetable oils available. 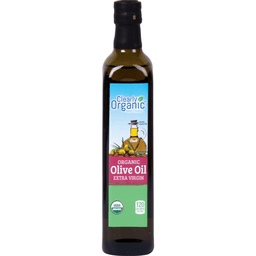 Great for restricted diets: Eliminates the need for oil, grease, fat or shortening. Adds no cholesterol, sodium or fat to your foods. The low calorie way to cook. 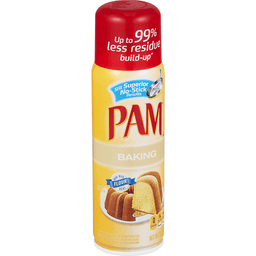 Contains over 95% fewer calories than butter, margarine or oil per serving. Economical and safe: Contains no alcohol or silica particulates. Goes further than oil, butter or margarine. 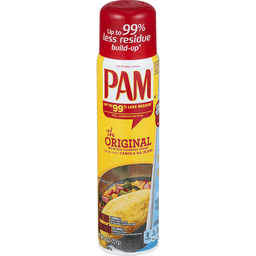 Easy to apply on skillets, pans, casseroles, grills, griddles, waffle irons, gelatin molds, skewers and even microwave dishes. 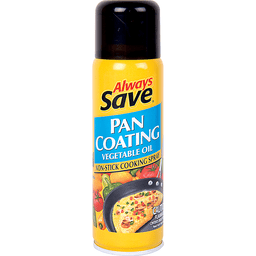 Aids no-stick cookware and helps prevent scratching of their surfaces. 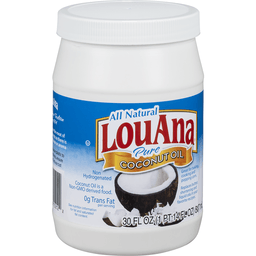 LouAna® Pure Coconut Oil. 100% Pure. Non-hydrogenated. 0g Trans fat per serving. 14 fl oz (414 ml). Coconut oil is a non-GMO derived food. Best uses: Bake. Saute. Moisturize & more! All with no coconut aroma or taste. Saute: Vegetable, coconut, peanut, canola, safflower. Stir-fry: Vegetable, peanut, canola. Opan-fry: Vegetable, coconut, peanut. Dressings: Vegetable, coconut, canola, safflower. Baking: Vegetable, coconut, canola, safflower. Suitable for medium heat up to 350°F. Coconut oil is solid below 76°F and becomes liquid at or above 76°F. Please recycle. 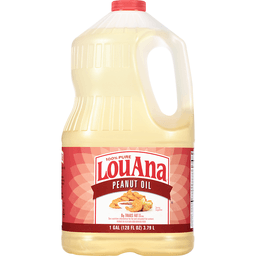 Louana is a registered trademark of Ventura Foods, LLC. Questions or Comments: Call 1-800-379-1041. Get more ideas at www.louanacoconutoil.com. 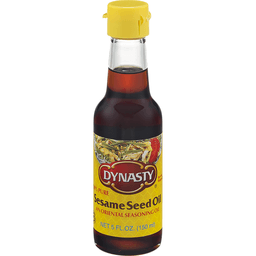 Dynasty Sesame Oil - Premium - Case of 1 - 5 fl oz. 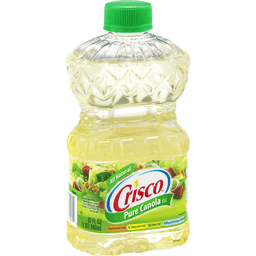 Crisco® Pure Canola Oil. See nutrition information for fat content. 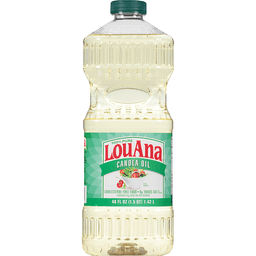 Canola oil is a cholesterol free food with 14g of total fat per serving. Cholesterol free. 1g saturated fat*. 0g trans fat*. 1290mg ALA omega-3 fatty acid*. *Per serving. Per 1 tbsp: 120 calories. 1g sat fat, 5% DV. 0mg sodium, 0% DV. 0g sugars. 32 fl oz (1 qt) 946 ml. 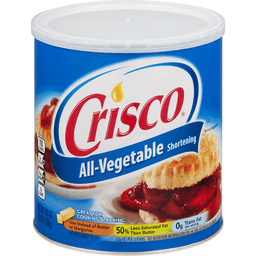 Crisco is Cooking™. 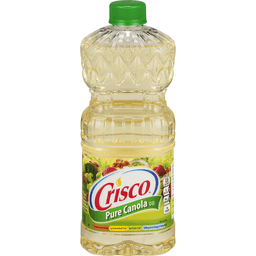 Crisco® pure canola oil is great for all purpose cooking. Especially good for: Salad dressings. Baking. Marinades. Sauteing. Processed from Canadian oil. Questions Comments 1-800-766-7309. www.crisco.com. © TM/® The J.M. Smucker Company. 100% natural. 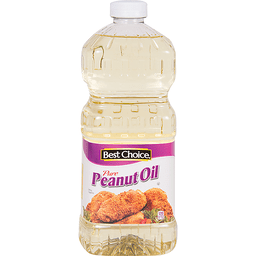 Excellent Source of: Omega-3 (ALA [Contains 674 mg per serving, which is 42% of the 1.6 g Daily Value for ALA]); 0 g trans fat per serving; cholesterol free. 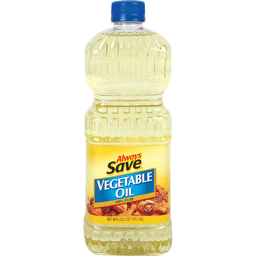 Vegetable oil is a cholesterol-free food with 14 g total fat per serving. 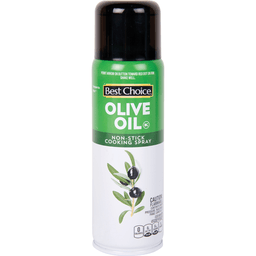 Great, versatile all-purpose oil. 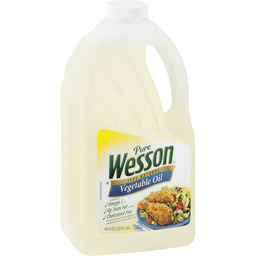 Pure Wesson 100% Natural Vegetable Oil is the perfect all-purpose cooking an baking vegetable oil. 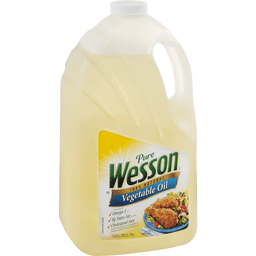 Wesson Vegetable Oil can be used for baking or frying and has a light taste that lets your cooking flavors shine through. 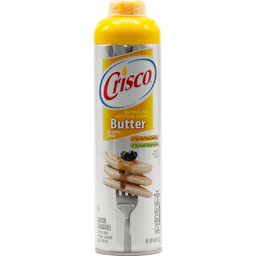 Crisco® 100% Canola Oil Original No Stick Spray. For fat free cooking. 0g trans fat per serving. 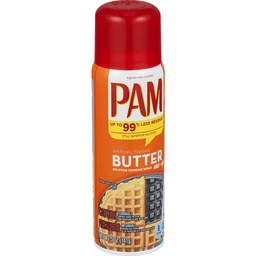 Per 1/3 second spray. 0 calories. 0g sat fat, 0% DV. 0mg sodium, 0% DV. 0g sugars. Simple Touch® spray with click & go nozzle. 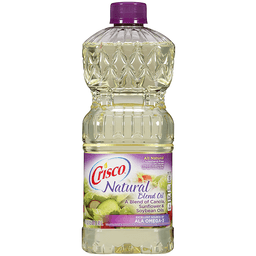 Use Crisco original no stick spray for: Sauteing, broiling, baking and stir-frying. Coating meat, poultry and fish before seasoning or grill. Cooking eggs, waffles, French toast and pancakes. 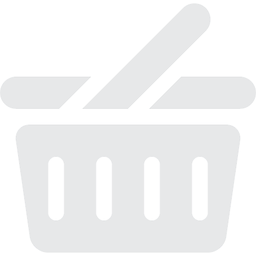 Casserole dishes and microwave cookware for easy food removal. *Adds a trivial amount of fat. Processed from Canadian oil. Questions Comments Call toll free 1-800-766-7309 M-F 9am-7pm (EST). Please reference code from bottom of can when calling. 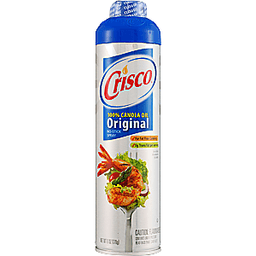 www.crisco.com. 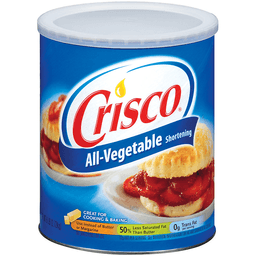 Crisco All-Vegetable Shortening Butter Flavor. Naturally and artificially flavored. Great for cooking & baking. Use instead of butter or margarine. 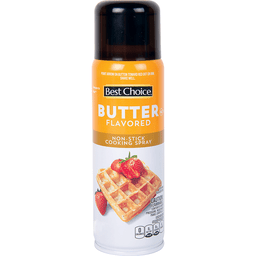 50% less saturated fat than butter. 0g trans fat per serving. 12g fat per serving. See nutrition information for fat and saturated fat content. Per 1 tbsp. Calories 110. Sat fat 3g 16%DV. Sodium 0mg 0%DV. Sugars 0g. 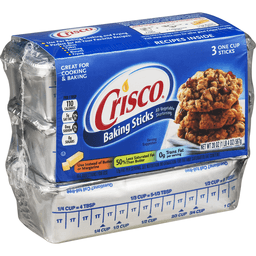 Crisco Is Cooking. Use for baking, cooking and frying. E-Z open quality seal. 50% less saturated fat than butter. 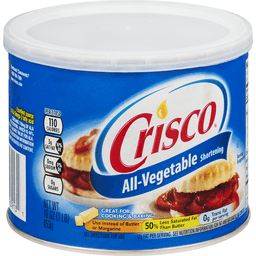 Crisco shortening: 3g saturated fat per tablespoon. Butter: 7g saturated fat per tablespoon. 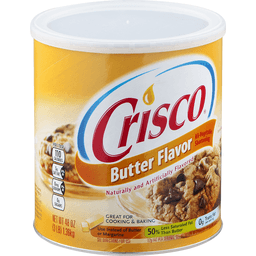 Crisco shortening contains 12g of fat per serving. Excellent source of ALA omega-3 fatty acid. Contains 710mg of ALA per serving, which is 44% of the 1.6g daily value for ALA. See nutrition information for fat and saturated fat content. Pillsbury Best is a trademarks of the Pillsbury Company, LLC, used under license. Questions Comments 1-800-766-7309, www.crisco.com. //The J.M. Smucker Company. 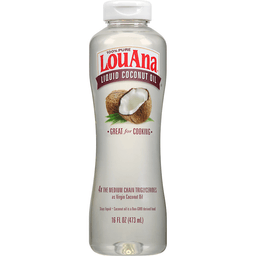 LouAna® Liquid Coconut Oil. 100% pure. 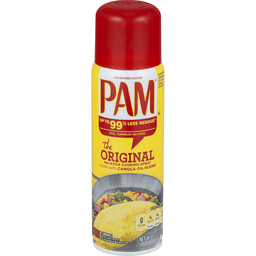 Great for cooking. 4x the medium chain triglycerides as virgin coconut oil. Stays liquid. Coconut oil is a non-GMO derived food. 16 fl oz (473ml). 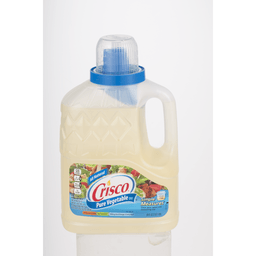 For easy pouring, measuring, sauteing and baking. No coconut aroma or taste. 4x the MCTs as virgin coconut oil. 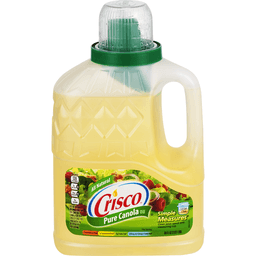 Alternative to margarine or cooking oil. Gluten-free. Coconut oil from Philippines. Please recycle. Questions or comments: 1-800-379-1041. Get ideas at louanacoconutoil.com. 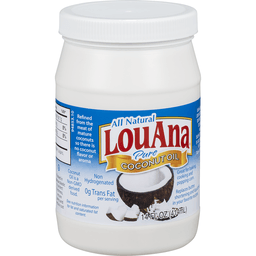 LouAna is a registered trademark of Ventura Foods, LLC. 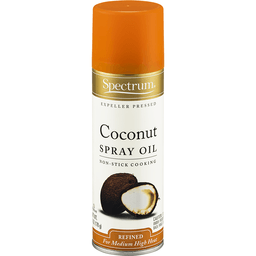 Spectrum Naturals Coconut Spray Oil - 6 oz. 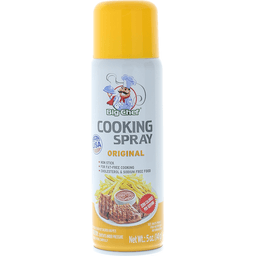 SPECTRUM NATURALS EXPELLER PRESSED COCONUT OIL COOKING SPRAY IS THE CHEF'S CHOICE FOR ALL-PURPOSE COOKING. 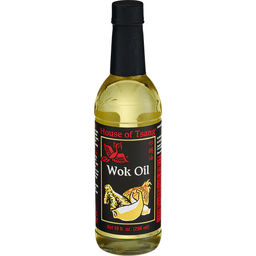 NON-GMO, THIS OIL IS BEST FOR SAUTÉING OR PAN FRYING OVER MEDIUM HIGH HEAT AND IS ALSO IDEAL FOR BAKING. OUR EXPELLER PRESSED COCONUT OIL HAS THE SCENT OF FRESHLY CRACKED COCONUTS AND A CLEAN NATURAL FLAVOR. INCLUDES ONE 6 OZ. 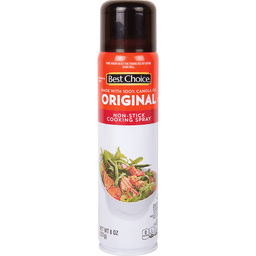 CAN OF CHOLESTEROL AND TRANS-FAT FREE SPECTRUM NATURALS EXPELLER PRESSED COCONUT OIL COOKING SPRAY. 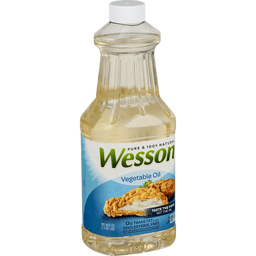 Wesson® Pure & 100% Natural Vegetable Oil. Taste the food. Not the oil. 0g trans fat per serving. Cholesterol free. See nutrition information for fat & at fat content. 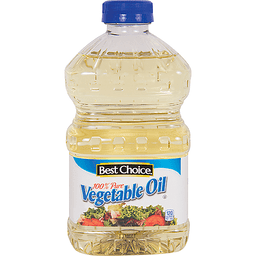 Vegetable oil is a cholesterol-free food with 14g total fat per serving. Per 1 tbsp serving: 130 calories. 2g sat. fat, 10% DV. 0mg sodium, 0% DV. 0g sugars. ConAgra Foods®. Food you love. 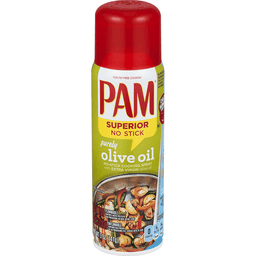 Great, versatile all-purpose oil. 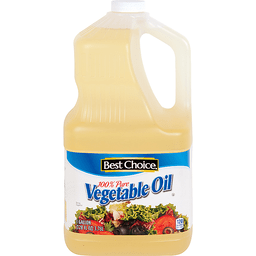 Pure Wesson 100% natural vegetable oil is the perfect all-purpose cooking and baking vegetable oil. 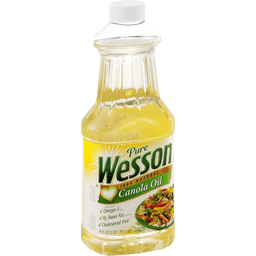 Wesson vegetable oil can be used for baking or frying and has a light taste that lets your cooking flavors shine through. Taste the food not the oil. Use for baking, frying & sauteing. Questions or comments: Visit us at www.wessonoil.com or call Mon.-Fri., 9-00 AM-7:00 PM (CST), 1-800-582-7809 (except national holidays). Please have entire package available when you call so we may gather information off the label.